Did Geologists Discover 'Fountains of the Deep' From Genesis Flood? - Breaking Israel News | Latest News. Biblical Perspective. A team of scientists studying diamonds found as far as 500 miles underground has discovered a form of crystallized ice that has never been observed in nature before. The discovery indicates that huge water reserves flow through the earth’s mantle in a manner that very much resembles the “Fountains of the Deep” mentioned in the book of Genesis. The team, led by geoscientist Oliver Tschauner from the University of Nevada, investigated crystals that formed inside diamonds, which originated 250-500 miles underground, a region of the earth’s mantle known as the “transition zone.” The findings were published Thursday in the journal, Science. The researchers discovered crystals were from the type, “ice-VII” that is formed under enormous pressure. The scientists estimated that the transition zone, where minerals are more soluble, holds up to ten times more water than other geologic regions. The samples of the diamonds were collected in China, South Africa and Botswana, suggesting that underground pockets of water can be found all over the world. The ice-VII found in these diamonds was the first scientific evidence of aqueous fluid from the deep mantle. Ice-VII is a solid on the earth’s surface but is in liquid form at the depths from which it originates. Dr. Oded Navon, professor of geology at Hebrew University, reviewed the study and was willing to discuss the applicability of the discovery of ice-VII to the Bible on a hypothetical level, concluding that the discovery of ice-VII was not evidence of the “Fountains of the Deep” mentioned in the book of Genesis..
“The study did not find proof of a layer of water under the earth,” Professor Navon said to Breaking Israel News. Though Navon does not personally believe that the Bible describes actual historical events, he suggested how the discovery could be read into Biblical stories. “The waters were divided by the ‘rakia,’ (firmament) which is like a thin layer,” the professor said, citing the verse in Genesis. Although respectful of religion, Dr. Navon does not believe it has any relevance to his studies. 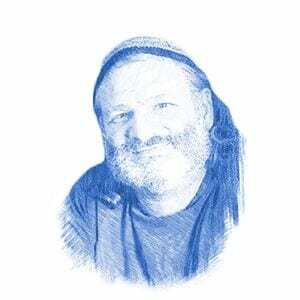 “The Torah is a beautiful Jewish mythology written by people I adore. It undoubtedly has great worth, but it is mythology, especially in relation to nature,” he said. Dr. Gerald Schroeder, an Orthodox Jewish physicist with a Ph.D. from the Massachusetts Institute of Technology (MIT), believes the opposite is true; that the new discovery relates to the story of Creation. “There is enough water there to easily flood the earth, but I don’t think this is the source of the water for the flood,” Dr. Schroeder told Breaking Israel News, explaining his interpretation of the Biblical flood as limited to a specific region. “For the flood in the time of Noah, the words used are ‘pnei ha’aretz’ (surface of the land),” Dr. Schroeder noted. “‘Ha’adamah’ never appears again by itself in the Torah,” he noted. “Ha’adamah refers to a global phenomenon, but ‘haaretz’, as it describes the flood, refers to a regional phenomenon. At the same time, Dr. Schroeder does not believe that the discovery of ice-VII is not relevant to Noah’s Flood. Dr. Schroeder does feel however, that the discovery helps to emphasize the role that water plays in creation. Dr. Schroeder feels this Biblical aspect of water is lalso reflected in its physical characteristics. This dual explanation, combining religious and scientific concepts, comes naturally to Dr. Schroeder. He sees science and religion as not only compatible but two fields which must necessarily coexist. “People who know a lot about science usually get it wrong when they criticize Torah because they don’t know Torah,” Dr. Schroeder added. After a lifetime of religious and scientific studies, Dr. Schroeder sees the two seemingly divergent disciplines coming closer to each other.